Well I may have got a good night's rest but the weather was no better in the morning. Despite my best efforts, substantial 'as much as you can eat breakfast at 7am etc, I didn't get away until just before 8am. This was probably a good time to go with hindsight as I suspect that HGVs avoid the rush hour journey along the A5 into St Albans. Notwithstanding that the journey all the way to Barnet on A5 via St Albans (nice but didn't look around much), Colney, M25 junctions 22 and 23 via Blackhorse Lane, South Mimms certainly got me close to certain good and poor aspects of highways design. However, once in Barnet the excellent and free London Cycling Guide map series (I had carried the four relevant ones with me all the way) came into their own. They are absolutely superb, although I could have protected them better from the rain, and I enjoyed the whole way back from there on in. Routes are colour coded to one of six types and I easily followed yellow routes (quieter roads recommended for cyclist although not necessarily signed) all the way to Tottenham Hale. This is the current link to order cycle guides on line. The point at which I reached Route 1 (this is the route that goes through Kirkwall, hugs the east coast and passes our house enroute to Sandwich/Dover). The path follows towpath to west of the River Lee Navigation from Stonebridge Locks, however as there was only one arrow on the post it was not at all clear! Route 1 takes a little diversion across this footbridge and then around Hackney Marshes. It is completely unnecessary, today it required a splash through 300mm of water and a trek across muddy playing fields just to get to the same canal towpath I was on already! I wasn't very impressed with myself for not noticing that on the TfL cycle guides. I passed by the Olympic site and into Mile End. After turning west away from the Hackney Cut of the River Lee Navigation and along side the Hertford Union Canal, the route took me through Victoria Park and then south through Mile End Park, between Mile End and Limehouse. I have to admit not being at aware of the existance of the very pleasant series of parks. On leaving the park, I almost made a fateful mistake on turning right on CS3, Cycle Superhighway 3, which although it was clearly signposted to Tower Gateway did look very inviting! Not a great photo but the route 1 takes lifts up and down from the pedestrian tunnel (designed by Sir Alexander Binnie). Built from 1899 to 1902 it replaced an sometimes unreliable ferry service. The southern tunnel entrance in Cutty Sark Square. The tunnels and their staircases are currently be refurbished as it the Cutty Sark (out of shot but behind me!). A quick pit-stop to buy lunch of sandwich, fruit, Eccles cakes and orange juice from M&S and I was straight back on the road. 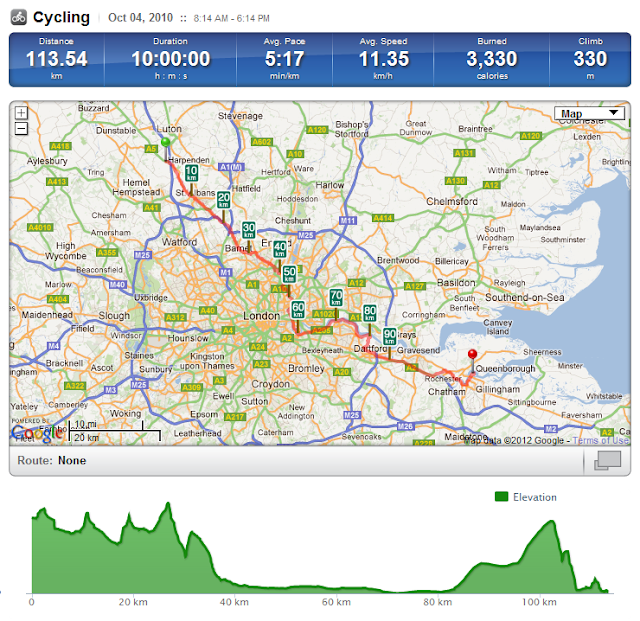 I'd divided today into 5 sections of 20km each and Greenwich was the end of section three. I knew I had to keep moving! Several hundred extras being allowed to cross Romney Road for a the next of the Pirates of Caribbean films, On Stranger Tides (due for release in 2011) part of which is being shot near Greenwich Park and the National Maritime Museum (thanks for the help on this one - see comments and this link). The characters looks very believable to me! Looking upstream back towards Canary Wharf and O2 Dome with Thames Barrier in the foreground. Route 1 joins the path alongside the River Thames for the next 10 miles (apart from a short break at Erith) when it turns inland to follow the River Darent and Crayford Creeks into Dartford. Some of the Grade I and II listed buildings in the Royal Arsenal Development. Over 3,000 people now live on the coverted Royal Ordnance Factory site (closed in 1967). Plans have now been submitted for a new masterplan encompassing further land along the river. The new plans incorporate a further 1,200 new homes, along with 270,000 sq ft (25,000 m2) of commercial, retail, leisure space and a 120-bedroom hotel. Also included in the plans is the new Woolwich Crossrail station, which has been part-funded by Berkeley Homes. The cycle route continues past the Riverside Resource Recovery (RRR), energy from waste facility. According to the company's website, the Riverside Energy from Waste facility at Belvedere in the London Borough of Bexley, is Cory Environmental's single most significant development project. With an average annual capacity of 585,000 tonnes, it will be an important strategic river-served waste management facility for London, helping the capital to manage its own waste, keeping over 100,000 HGVs off the capital's congested roads each year and making a real contribution to London's ability to meet its landfill diversion targets. Looks a little like an incinerator to me. Dartford Salt Marshes with the Dartford River Crossing (QEII bridge, 1991) just visible in the gloom! Once in Dartford the route is easy and follows a dedicated path in the corridor of the A2, but away from it, after Bluewater. Further along the same stretch the route utilises the old A2 surface for several mile. The path meanders pleasantly with new landscaping on either side. Familiar local journeys suddenly didn't seem that far nor the gradients very steep at all as I rapidly found myself pedalling back over the bridge I'd started on a few weeks ago. Looking the other way from the way I left 20 days ago, across the bascule bridge taking me across onto St Mary's Island, Peel Port's Chatham Dockyard can be seen beyond the first basin. Nice to see some familiar scenes from my regular rides. The filming at Greenwich is for the next Pirates of the Caribbean - I take it you didn't spot Mr Depp? no - if only I'd known!